The outcome of war used to be the overriding question. Nowadays, when it's West vs. non-West, the vast disparity in economics, technology, materiel, training and organization virtually assures a Western victory. This assumed, attention focuses on very different matters, such as the duration of hostilities and the number of casualties. Note also how soldiers are now expected to observe police-like procedures and collect forensic evidence. Examples include U.S. forces vs. Saddam Hussein or Israelis vs. Hamas. The Western power fits the role of police force, the disgraced political leader becomes the criminal, and the non-Western population (e.g. Iraqis or Gazans) serves as victim of the crime. Slobodan Milošević, president of Serbia, arrested in March 2001 and died in his prison cell. 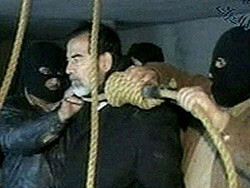 Saddam Hussein, dictator of Iraq, caught in December 2003, executed. Radovan Karadžić, president of Republika Srpska, arrested in July 2008 and being tried. Osama bin Laden, terrorist mastermind, executed in May 2011. Ratko Mladić, Bosnian Serb military commander, arrested in May 2011, his trial starts today. Mullah Omar, dictator of Afghanistan. Mu'ammar al-Qaddafi, dictator of Libya. Relatedly, the International Criminal Court has twice issued warrants for arrest against Omar al-Bashir, dictator of Sudan, on charges of genocide, crimes against humanity and war crimes. Saddam Hussein, about to be hanged. Oct. 20, 2011 update: With Qaddafi gunned down today, hiding in a drain pipe under a highway, Mullah Omar remains the only tyrant-on-the-lam.